How I got to here . . . I started playing violin when I was five. That's me with my little sister. I went to Oberlin Conservatory where I studied music. I also studied art and pedagogy. Pedagogy is the art of teaching. A few years after moving to the Bay Area, I completed a Masters of Fine Art at Mills College. Those people who look like me are my parents. 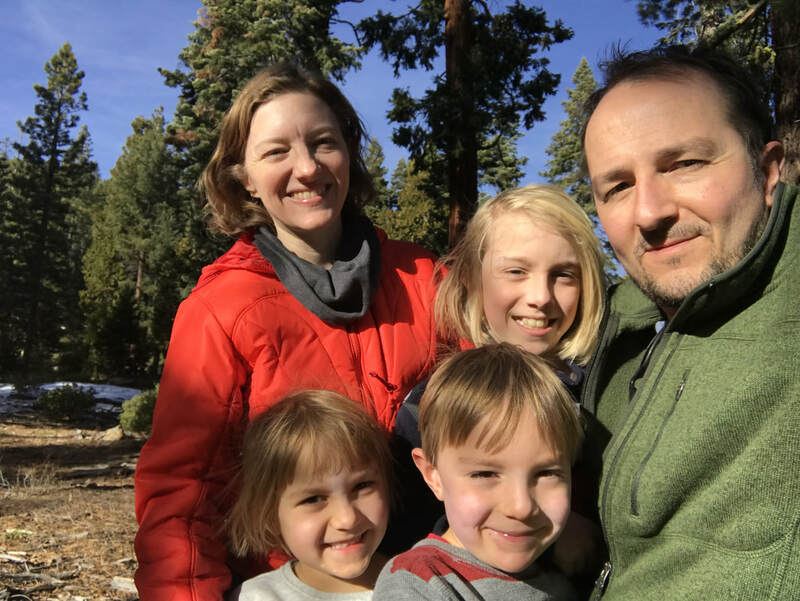 In 2015, I began a new route as a children's librarian, a field in which I hope to use my teaching skills to affect a broader community of children and their families. I am slowly earning a Masters of Library and Information Science at San Jose State University and I work in a public library. I review books for the Association of Children's Librarians. I am also a volunteer storytime reader for Oakland Public Library's Books for Wider Horizons program. I bring a lot of music to my storytimes and am becoming quite proficient on the ukulele. I grew up in a ranch house in Indiana surrounded by forests and meadows. The land was flat so I could see right off the edge of the horizon. When the sun rose, it filled the sky and melted the landscape. I wanted to be a children's book illustrator. I self-published many books like this one but I did not become a professional children's book illustrator. After college, I decided to move to San Francisco and try new types of music. I played in my first band. We had an excellent weekly gig playing in a cafe-laundromat. We got to do our laundry for free. I have since played with many inspiring musicians in all types of venues. Fancy places are exciting but I love small, comfortable spaces where the audience is close and the beer is free. 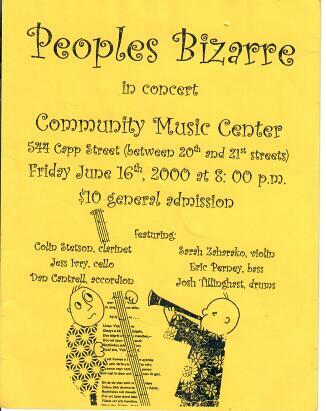 I worked many years as a freelance musician and taught for a while at a community college. 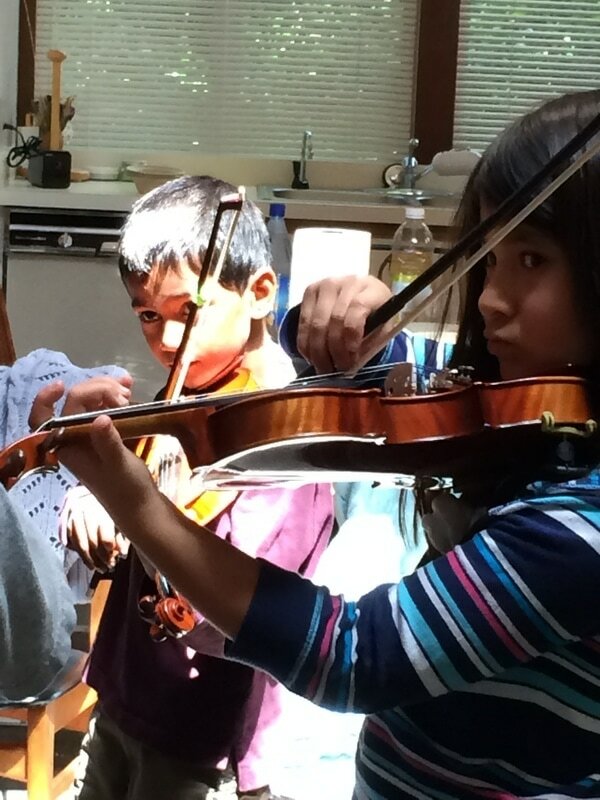 But I am most proud of my violin studio, in which I've worked closely with students ages 4 - 19, collaborated with inspiring teachers, and led countless classes and performances. My students have enriched my experience in music and life. About half way down this page, I started playing music with Eric Perney. We are still playing music and are now raising three energetic kids who love to sing together, each to their own tune and tempo.